The Transformers are a race of robots that are divided into Autobots and Decepticons, the first led by Optimus Prime and the second by Megatron. The good side is that of the Autobots and we will have to help Optimus Prime collect primary energy resources in order to carry out the final battle against the chief of the decepticons. Collect all the coins of each level and energon them to overcome it and continue obtaining resources. When you overcome a phase you will find another extra in which to get more coins and once you overcome it you will have to go to the next mission. Each time you surpass a mission they will give you a code that will help you not to have to start from the beginning if they kill you. 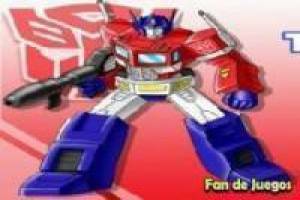 Enjoy the game Transformers voltran, it's free, it's one of our transformers games we've selected.